Stick the magnet onto the bottom (negative end) of the battery, and stand the battery on top of it. Either stick the nut onto the top of the battery (positive end), or use a second magnet to hold it on. If you do this arrange the magnet so it is the other way up to the bottom magnet. You now want to bend your piece of wire, so that it goes from the centre of your nut, making a contact with the positive end of the battery, to touch onto the side of the magnet and complete the circuit. This is more difficult than it sounds, as the wire needs to be able to spin freely, without falling off or loosing contact, one nice solution to this is to bend your wire into a spiral so if it spins too fast it is held on by the other side of the spiral. 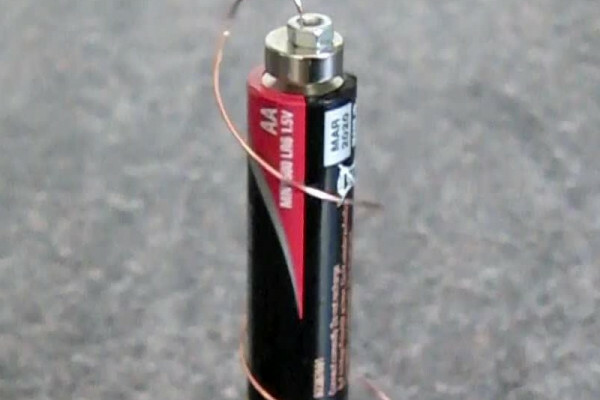 build an electromagnet this also means that a magnet must apply a force to an electric current. This force is at right angles to the current and the magnetic field. A wire feels a force if a current flows through it when it is in a magnetic field In a coil these forces add up to produce a force like that of a permanent magnet. In this motor the force is largest near where the wire meets the magnet. If the wire meets the magnet near the middle, the field is at right angles so it feels a force pushing the wire around, and this force keeps pushing the wire all the way around the magnet, making it rotate. Previous Is your head this big?